The Colonial Army Medical Corps also named the Colonial Medical Corps was started in 1903 three years after the Colonial Army was set up and wound up in 1968 when it had to merge with the General Medical Corps of the Armed Forces, so that its legal existence spreads only over a sixty-five year long period of time. In the meantime its designation changed twice : "troupes d'outre mer" in 1958 and then "troupes de marine" in 1961. These are purely formal records as prior to 1903 Naval Medical Officers and later physicians "of the colonies and protectorates" had already been present overseas. Long after 1968, the Armed Forces Medical Corps has also continued to carry out numerous overseas missions. The actions which were taken during this period, are only a part in the history of trades between France and Overseas Countries. As of 1900 the French Colonial Domain had achieved its development but later in 1920 Togo and Cameroon in Africa and also Lebanon and Syria in the Middle East were added as "mandated territories". The French Metropolitan Army Medical Corps was in charge of the whole Maghreb which included Tunisia, Algeria and Morocco. All other parts of the French overseas empire were left to the care of the Colonial Army. From the early days of the French colonization undertaking, this Medical Corps faced entirely unknown medical conditions for which no appropriate therapy were known. After unsuccessfully striving to recruit civilian physicians the Colonial Medical Corps was set up and it became in charge of achieving a peaceful conquest. It was first set up according to the organization pattern of the general administration in overseas territories but because of the wide range of its duties, it was later granted some kind of autonomy which gave it the ability to run on its own. During the first French colonial drive (1534-1763) known in the public as "the race for spices" which mostly targeted the Americas, medical services were made available there, most specially in Quebec and in the Carribean plantations, through "surgeons, physicians and apothecaries of the King". Surgeons were the most sought after. As Father Labat put it in 1742 "The first issue a colonist has to address is to obtain the services of a reputable surgeon". All medical personnel were civilians. Hospitals were staffed and run by different religious orders. In 1689 the Ordinance of the Marquese of Seigneley, who was the son of Colbert, provided for the creation of the Navy Medical Corps. By the time of the second colonial drive, from 1830 onward, medical officers started to be on assignment in French military expeditions : senior and junior medical officers were in charge of maintening the good health of troops and also became progressively in charge of native populations. In 1846 in his book entitled "New Journey to the Negroes' Country" Anne Raffenel, who was an explorer and a purser officer of the French Royal Navy, wrote the following "Medicine is the best available passport for any european traveling across Africa". In 1875 a physician by the name of Dr Ballay was included in the Savorgnan de Brazza mission on the Ogoue River. 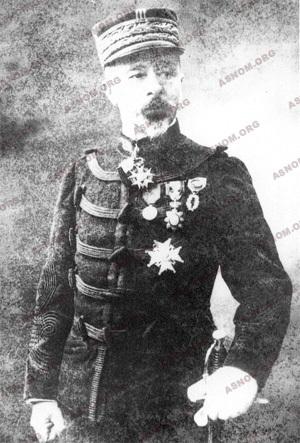 In 1887 V. Liotard who was a Navy pharmacist took part in the Sudan campaign, under the command of Gallieni. As Brazza trusted him, he led after two successful and peaceful territory appropriations, the first one from 1891-1894 in the Upper Oubangui region and the second one in 1897, one year prior to the Marchand expedition, in the region which straddles the border separating Egypt from Sudan. In 1891 Dr Grall escorted Marchand in Sikasso, Mali, and in 1897 Dr Emily did the same for the Congo-Nile expedition. It should be reminded that among the British, David Livingstone (1813-1893) was also an explorer and a physician. On the coast as well as or in the inner parts of continents Physicians and Pharmacists of the Navy took part in all pacifying or subduing operations. Just like the ones who were engaged in combat or in exploration some of them passed away, victims of their intrepidity, increasing the number of those who had already died in the line of duty. Permanent medical facilities were put in different ports of call or at the crossings of pilgrimage routes such as Zanzibar or Djeddah. From 1850 onward, in their makeshift hospitals Naval Medical Officers such as such as Corre, Fontan, Leroy de Mericourt, Beranger-Feraud and Dutrouleau started to study and make accurate descriptions of tropical scourges without having a clue as to what caused these diseases. These faraway countries which were plagued by these conditions were therefore deemed unsafe and unhealthy. In 1890 ,it was time to set up a Colonial Medical Corps which would no longer be under the command of the Navy but under the command of the Ministry of Colonies. At about the same time it started being mandatory for physicians to have an MD. During the period of pacification, the tasks of physicians remained huge and non gratifying ones. These regions, situated in the tropics with hot and most of the time humid climates, were unsafe. Populations living there were stricken down by either endemic or epidemic terrible diseases. Some scourges which, by the end of the nineteenth century had nearly fully disappeared from Europe were still in full swing there, such as smallpox, rabies, leprosy, cholera, and plague. Moreover some other diseases such as yellow fever, trepanomatoses, dysenteries and especially malaria were widely spread and were harmful to individuals who had been unable to develop any natural defense against them as they had previously never come across them. These conditions were poorly known and no medication against any of them had yet been discovered. which are all characteristics of a severely exhausted organism". Grall* was able to determine that casualties during the Tonkin Campaign from 1883 to 1889 resulted mostly from medical conditions such as malaria, cholera, amoebiasis. He showed that there had been fourteen times more casualties due to medical conditions than casualties occuring on the field of action. It was going to be even worse in Madagascar in 1895 where more than 25% of the expeditionary force was lost to Malaria. Quinine had been discovered and used since 1820 but its preventive use had not yet been codified. Though a few physicians initiated the use of a preventive regimen of quinine with a daily dose .In 1888 ,during a four month period of time, Laffont* crossed Suddan and each member of his expedition which included two hundred and fifty servicemen was required to take orally 100mg of quinine every day and only one casualty out of the two hundred and fifty troops was recorded. As it unfortunately happened quite recently, isolation and resistance due to the preconceived ideas of the time, prevented this report from being widely circulated. From the very beginning of colonial conquests, physicians and pharmacists who escorted troops provided health care to French servicemen but also to locally recruited auxiliaries and to their relatives. It did not take long before making native populations able to take advantage of them. In Madagascar, with General Gallieni 's directive put out in 1889 the framework of a free medical care service for the whole population was set up. In 1903 Grall* in Indochina followed suit and the same also was done in Africa. At first populations living close to military settlements were the only ones which could have access to medical care as many places of these countries remained beyond reach and no road had yet been built. In main harbours, Saigon ,Dakar, Grand Bassam... the Navy built hospitals where European and native people as well could be admitted and taken care of. By the end of the nineteenth century several attempts were made to set up a civilian medical corps of the colonies, just as what had already been achieved in Algeria. The French did not care much and looked even rather defiant. Clemenceau strongly objected to Ferry's territorial ideas of expansion as with the 1870 French defeat, public opinion was only thinking of taking its revenge in Europe and was therefore not inclined to colonial conquests. Naval medical personnel whose expertise in the field of tropical medicine was widely acknowledged, were offered a civil servant statute which they declined to accept as they did not want to lose the benefits, attached to their statute of Naval officers. And finally, in 1890 the "Medical Corps of Colonies and Protectorates" was founded along a military frame. 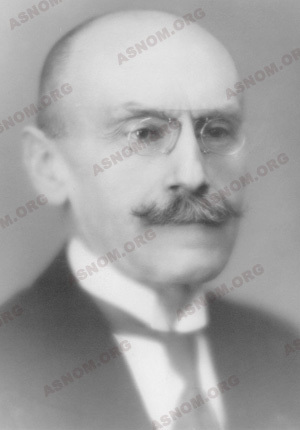 A senior physician with the rank of "Medecin Inspecteur de Premiere Classe" (firstclass Medical Inspector) was in command, and gave his orders to physicians and pharmacists who had the same rank designations as other officers in the rest of the Armed Forces. They were trained at the "Ecole de Santé Navale" (Naval Medical School) which was founded the same year (1890) in Bordeaux. Naval Medical Officers on active duty were then given the choice of signing up for the new corps instead of continuing with the one they originally were in. Some civilian physicians such as Yersin* (in 1891) were also recruited directly. This Medical Corps was placed under the authority of the Ministry in charge of the Colonies who was, according to the time, the Ministry of the Navy, or the Ministry for Trade and Industry and this lasted until 1894 when a Ministry of the Colonies was finally set up. The statute of these servicemen who were only working for the benefit of civilian populations was somewhat ambiguous as they were not appointed to any military unit and this position which was named "hors cadres" meant that they were "out the frame of the military" and were subsequently not under the command of any high ranking officer ! 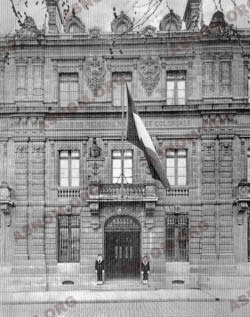 In 1897 the Highest French Administration Court of Justice was contemplating denying these personnel their Military Statute as it looked like they were at the same time altogether military personnel and civilians. This proposal was dismissed after a heavy lobbying of those concerned and everything went back to normal in 1903 three years later, with their integration into the Colonial Army which had just been set up with troops from the Navy. From this date onward a minority of members of Colonial Medical Corps personnel (10%-20%) have been posted in units of the Colonial Army "within the frame of the Colonial Army" while most of them remained out of it, as they were on assignment in the colonies providing native populations and other people as well with healthcare. This distribution of personnel had nevertheless to be changed the other way around during times of war such as in 1870 when Bazeilles fight gave a longstanding testimony of the courageous values of the Marine Corps Blue Division, and then during the two World Wars, and also during the Indochina and Algeria Independence wars. The military framework was accountable for motivating, training, guiding these personnel and conceiving the outlines of their duties with the ensuing result of having them bound by a remarkable "esprit de corps". Military discipline and the feeling of complementing each other resulted in bonds of solidarity and of friendship which in many instances greatly helped to overcome first the difficulties of life when posted in faraway places and also to obtain better outcomes for their undertakings. Stress should also be laid on the fact that some observers deplored the monolithic frame of the Colonial Medical Corps which looked to them as hardly open to incoming concepts. Scattered across a territory according to the needs of the Military, "Colonial Ambulances" were set up. As suggested by their designation these were real mobile medical facilities dedicated to the care of out - and of in - patients as well, as they were supplied with means of transportation to bring in incoming patients or evacuate them, and also to refer any of them to another institution whenever this was needed. Civilians could also receive medical care there for free. At first they were treated as outpatients but notabilities and traditional chieftains who had been impressed with the results of medical care and with the efficacy of vaccinations had a few makeshift houses built around these medical facilities: this is really how the hospital network was all started. In the meantime physicians trained native hands while teaching them some emergency medical procedures: these first steps were followed by institutionalizing the training with the building of medical schools, and also of nurse and midwife training colleges. Within a few decades later, the health care system had improved and could reach places located deep inside these territories. With the help of native healthcare auxiliary technicians, physicians in isolated places (dubbed "bush doctors") were exclusively in charge of providing medical care to native populations. This venture was a remarkably successful one. In French West Africa alone, from a few thousand consultations per year in 1905, the numbers went up first in 1920 to three hundred thousand and then to ten million in 1935. There were ten dispensaries-ambulances in this territory in 1905 and eight hundred and fifty two medical facilities in 1949. The main hospital of the colony which had several departments with a maternity as well and different clinics constituted the pivot of this network. In the city which was at the head of each district, the same kind of medical facility, but of smaller dimensions, was to be found. It was run by a European physician and one or two auxiliary native practitioners. In each subdivision there were also healthcare facilities such as dispensaries and clinics which were run by nurses. This network was designed according to population numbers and also according to the means of communication which were available. At the district and subdivision levels, the physician or a nurse made regular rounds in the countryside on market days or on any other occasion the population had to gather. In spite of limited supplies of medications due to financial constraints, this kind of individual medical practice was strongly appreciated by native populations. Nevertheless, its efficiency was deemed insufficient for the fight against major tropical endemic diseases and this became the duty of "Service de Lutte contre les Grandes Endemies" (Department for Control of Major Endemic Diseases). As of 1930 the number of locally trained health auxiliaries in Africa, in Asia and in Madagascar was higher than the number of physicians and pharmacists of the Colonial Medical Corps. As time was going on, these health technicians started to be entrusted with more important tasks and duties. Overseas tours of duty for physicians and pharmacists as for all other civil servants as well, were two or three year long, depending on the climate of the territory they had been posted to. From 1945 onward the duration was set to thirty months and upon coming back to France they had a four month leave. After, they were posted to a unit of the Colonial Army in France for a period of time which did not exceed one year. Some of them took advantage of being in France to specialize in some field of medicine and for those who had applied for practicing in hospitals or for a position of medical trainer in the Colonial Army Medical Corps, they could also get ready and take the relevant exams during that time. At the turn of the century the French colonial empire was ten million square kilometres wide with a population of thirty million people. As time was going on, the colonial administration had to bring about some changes in its grid and in the medical network as by the early 1960's the total population was in the eighty million range. From 1903 up to 1939 the Health Services of a Colony or of a group of Colonies were under the supervision of the Highest Administrative Authority on assignment there, namely a Governor or a General Governor. The Head of the Health Services, was in charge of deciding on assignments for new comers and also of organizing health services and of setting up new medical facilities or municipal clinics for outpatients or other specialized centres as he saw fit. He was also responsible for the supervision of sanitation services. At the top of each federation of colonies a Federal Director of Health was to be found. He was a senior physician with the rank of General and he was assigned the duty of coordinating and of harmonizing health programs but Governors did not always agree to take action. Most of the time in fact health issues were not a priority for these high administrative authorities and they looked keener on favouring investments with quicker returns. In 1939 an Authority of the Colonial Health System was finally set up, as the Ministry of Colonies had become aware of these shortcomings. It was an autonomous department within the the Ministry which had its own operating budget. It was just like a "Colonies' Ministry of Health". Health programs of different colonies could be coordinated and harmonized there. Updating records of military personnel and promoting them to higher ranks remained the exclusive duty of the Colonial Army Department at the Ministry of War. During the same year, in French Western Africa and in Togo the "Sleeping Sickness Autonomous General Service" was set up in order to achieve the control of this disease through a strong, specific and coordinated action, as it was a real scourge which devastated these territories. This was exactly what Jamot's* doctrine was all about : "prevention is efficacious only when medical squads can go and come across populations in the very places where they live". Mobile Hygiene and Prophylaxis teams were set up which while crisscrossing the territories they had been assigned to, they could diagnose and treat new patients, vaccinate populations and could also try to prevent major tropical endemic scourges such as Sleeping Sickness, Leprosy , and Onchocerciasis. Smallpox was eradicated from Madagascar and kept under control in other territories, Trypanosomiasis spread was checked and an enlarged program of vaccination was set up. Health measures could now be taken at the level of large geographic regions and no more at the level of smaller administrative regions. Thereafter, it was now possible to decide on a collective immunization program to be implemented from Dakar to Fort Lamy, without having to care for borders between colonies or between subdivisions, and in so doing it ensured its full efficacy. Research was not left on the back burner. 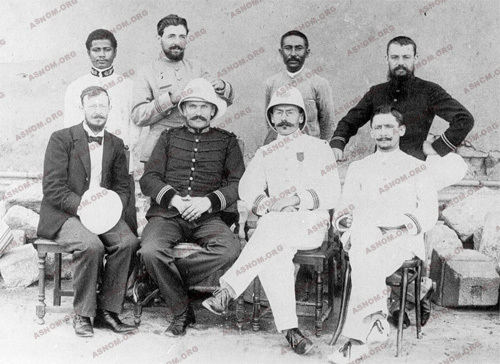 In 1903 the Pasteur Institute and the Colonial Medical Corps came to an arrangement which provided for the training of microbiologists of the Colonial Medical Corps. This resulted in having laboratories and Overseas Pasteur Institutes set up. - The Muraz Centre in Bobo Dioulasso, Burkina Fasso which up to 1945 was entirely devoted to Sleeping Sickness. - The Marchoux Institute in Bamako, Mali, was a centre devoted to the study of Leprosy and to the treatment of Lepers. Therapeutic trials were undertaken and reconstructive surgery for leprosy was also devised there. - The Trachoma Institute named IOTA in Bamako was in charge of addressing tropical ophtalmology issues. - An African Institute for Food and Nutrition Research named ORANA was set up in Dakar where ingredients of food were studied and mechanisms of malnutrition also. Iodin supplemented salt was advised in areas of goiter endemicity and protein supplemented diets in some other regions. In the wake of the Second World War political and sociological upheavals took place which resulted in reducing the size of the French colonial empire : colonies in the early nineteen sixties became independent countries with their own national health services. The shift went on smoothly. During the next two decade, Colonial Army personnel who were still working there, were placed under the authority of the Ministry of Cooperation. Later on ,some of their former native auxiliary medical practitioners who had been able to complete their training in France and were now fully-fledged MD's took over with also young native physicians who had been trained in their newly set up national medical schools. As of 1962 the Supervising Authority of the Marine Medical Corps which was the new designation of the "Colonial Army Medical Corps" was merged with the "Central Authority of the Armed Forces General Medical Corps" which since 1946 had already included the Metropolitan Army Medical Corps, the Air Force Medical Corps and the Navy Medical Corps. Finally a total merger was completed in 1968. - Pluchon P. : Histoire des Médecins et Pharmaciens de Marine et des Colonies. 1 vol. 430 p. Editions Privat, Toulouse 1985. - Lapeyssonnie L. : La médecin coloniale. Mythes et réalités. Coll médecine et histoire.1 vol. 310 p. Editions Seghers, Paris, 1988.